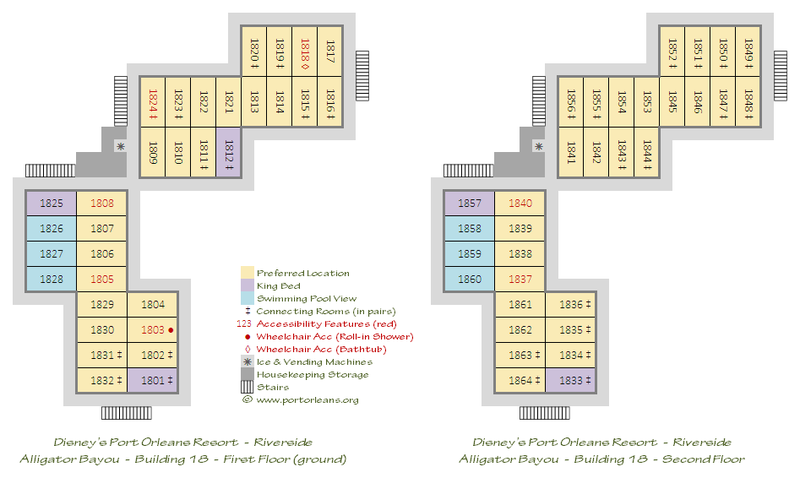 The combined Port Orleans Resort is the largest on Walt Disney World property, with over 3,000 rooms in four very distinct accommodation areas. Of course many people have their own favourite locations, and this page aims to help you decide which room category and area might be best suited for you. However please remember that any room location requests, beyond the basic category that you have booked and paid for, are just that, requests, and cannot be guaranteed. Anyway, sometimes spontaneous surprises can be even more fun than planning your trip to within an inch of its life. 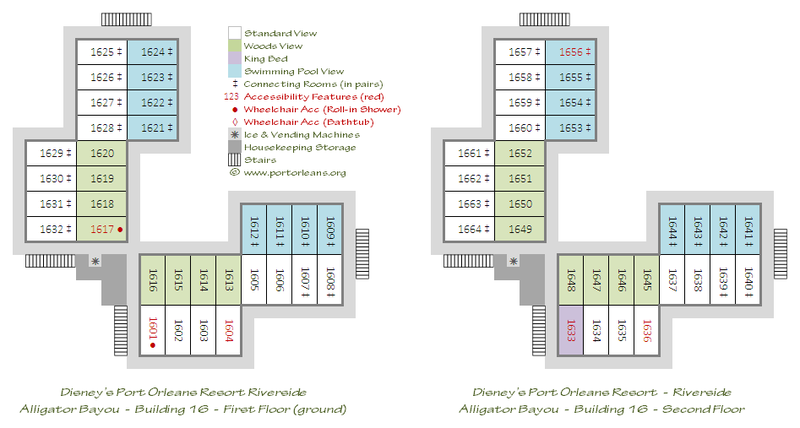 There are currently ten room categories available at the Port Orleans Resorts (increasing to 12 for 2019) priced with varying nightly surcharges. See the Room Rates page for the current pricing structure in detail. 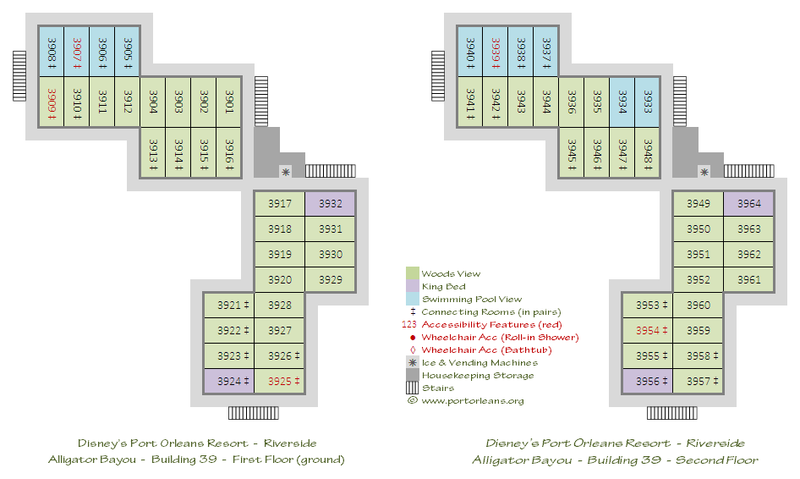 All of the rooms at the Port Orleans resort now feature either two Queen Size beds or one King Size bed, There are no longer any of the older double beds. Also all of the Alligator Bayou rooms contain a fold-down ‘Murphy’ style child-sized bed, located above the banquette bench seat, instead of the old trundle beds. If you want to avoid the slightly ‘motel-like’ aspect which can result from stepping out of your room and being faced with an asphalt parking lot, Garden View is a nice alternative without spending too much money. Preferred Location rooms are great if you have smaller children or suffer from mobility issues as they are among the closest rooms to the main buildings and the South Depot bus stop. Pool View at Port Orleans French Quarter are also all very centrally located, and all but six of them are on upper floors. Royal Room Pool View rooms are also all located fairly close to the footbridge leading over to the main buildings. 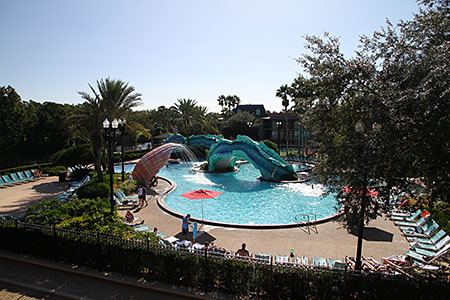 Unless you particularly want to watch over the kids in the swimming pool, I’d suggest an few dollars between a Pool View and a River View is probably money well spent, as the sections of the Port Orleans which overlook the Sassagoula River are generally among the prettiest in the resort. Although some people have commented that the noise from the boat horns can be a bit annoying in rooms located very close to the ferry docks, most people don’t seem bothered. 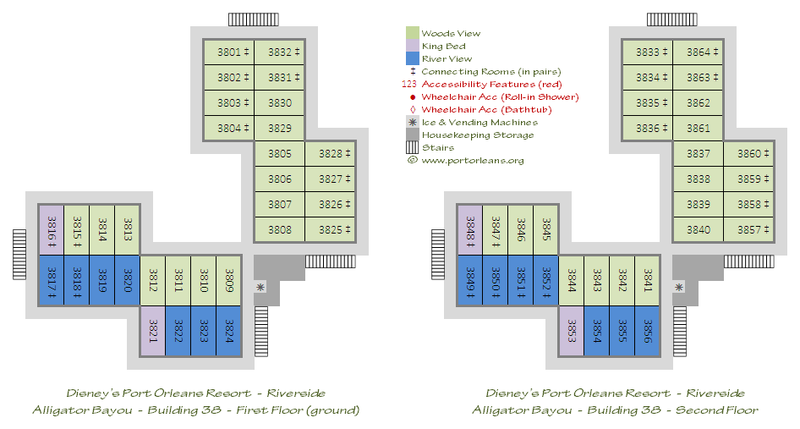 Where are the best room locations at Port Orleans Riverside? 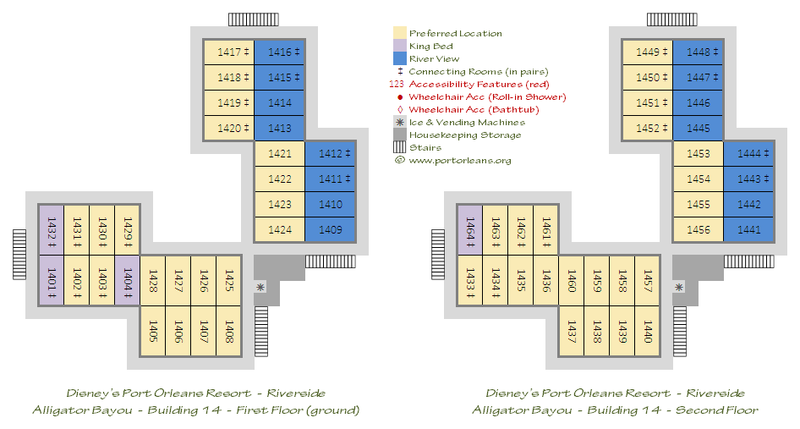 Riverside is a very much larger resort than French Quarter and is split into two distinct sections of 1,024 rooms each. Which section you prefer is very much a case of personal choice, and while I happen to like the laid-back secluded tranquility of the smaller Alligator Bayou lodges, there are many people who adore the romantic sophistication of the Magnolia Bend mansion buildings. Some people also comment that the rustic theming of Alligator Bayou feels somewhat “basic” and they prefer the comparative elegance of the mansion building rooms. 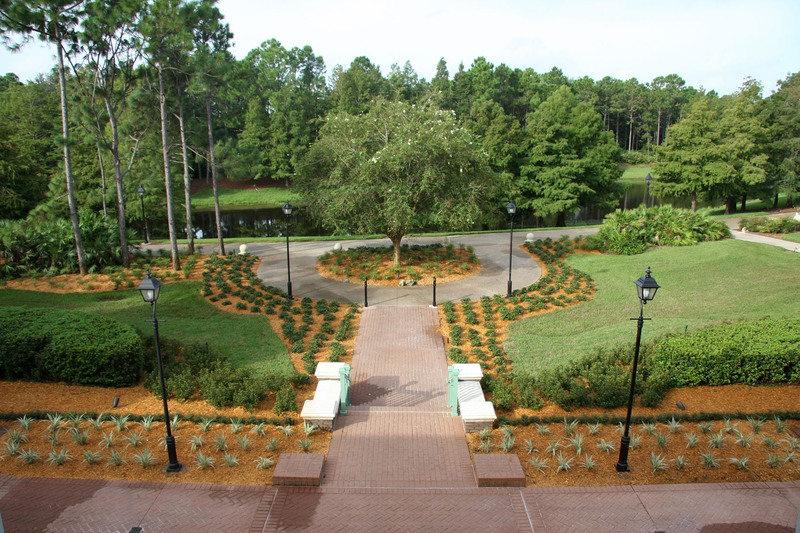 In Spring 2012, the opening of the new themed concept Royal Guest Rooms changed the equation still further, as the Magnolia Bend section has been split in two. You can still enjoy regular resort rooms within the Acadian House and Magnolia Terrace buildings, but Oak Manor and Parterre Place now exclusively feature the 512 new Royal Guest Rooms. The actual amenities included inside the guest rooms are pretty much the same in all of the sections though — see the Rooms page for full details — only the theming of the decor and the fittings change. 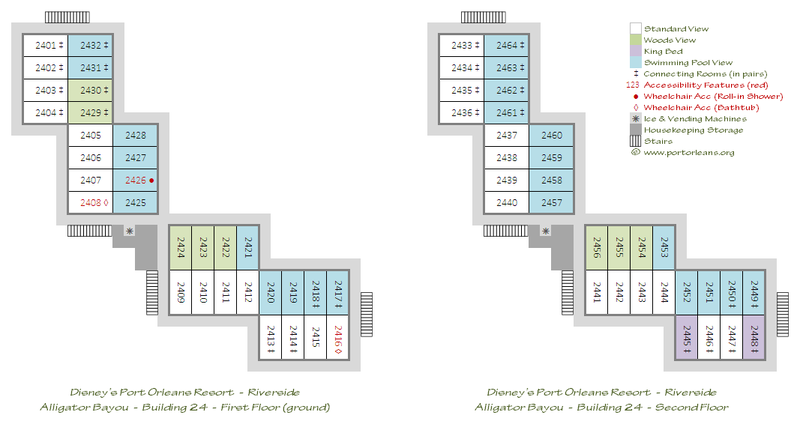 The only notable difference is that the Alligator Bayou section features the only Moderate resort rooms on Disney property to officially sleep five people, as they all feature an extra pull-down Murphy bed (child sized, approx. 63" x 30") located above the banquette bench seat. The extra pull-down bed is also included in the King Bed rooms in Alligator Bayou incidentally, allowing these rooms to sleep three people. Magnolia Bend consists of four three-story mansion buildings (with 256 rooms in each) with beautifully manicured gardens and landscaping, constructed around lovely courtyard areas with pleasant seating areas and fountains. In addition to the main swimming pool on Ol’ Man Island (located just across the river from the mansion buildings) there are also two quieter pools within the Magnolia Bend area. This is the only part of Riverside which features elevators, located in the central three-story section of each building. Rooms located on the river-facing side of the mansion buildings are generally preferable as they give easier access to the facilities, and the views are outstanding. The other sides of the mansion buildings are more convenient for quick access to the parking lots and the East and North Bus Depots, but the parking lot views are rather less enticing. Acadian House and Magnolia Terrace are located closest to the Ol’ Man Island swimming pool via a wooden bridge, and you can walk straight across the island to get to the main building for the lobby, shop, restaurants, etc. They also have convenient access to the North and East Depots respectively. Oak Manor and Parterre Place, which contain the new Royal Guest Rooms, are a little further to the south and are closer to a second bridge that takes you straight over to the main building, with an easy walk from there to the South Depot bus stop and the ferry boat dock. Oak Manor is also not too far from the East bus stop and is generally the closest Royal location for access to the main buildings. The Pool View Royal Rooms — almost all of which are in Oak Manor — are very centrally located and all guarantee you relatively short walks to the main areas. Parterre Place, on the other hand, is the most distant of the four mansion buildings and some of its more remote rooms can be quite a trek to get to anywhere. However the rooms in its northern-most wing are actually the best-located of all the Royal Rooms, with some of them just a few yards away from the bridge to the main building. Alligator Bayou represents the less affluent areas of the antebellum Old south, with sixteen rustically themed two-story Lodges (with 64 rooms in each) nestled amongst a sprawling series of informal streams, pools and lush wooded vegetation. As these buildings are smaller and more spread out they do tend to be somewhat quieter and more relaxed than the Magnolia Bend mansions. The Alligator Bayou section also features three additional quieter pools, which can be handy as it can be quite a walk from some of the furthest buildings over to Ol’ Man Island. 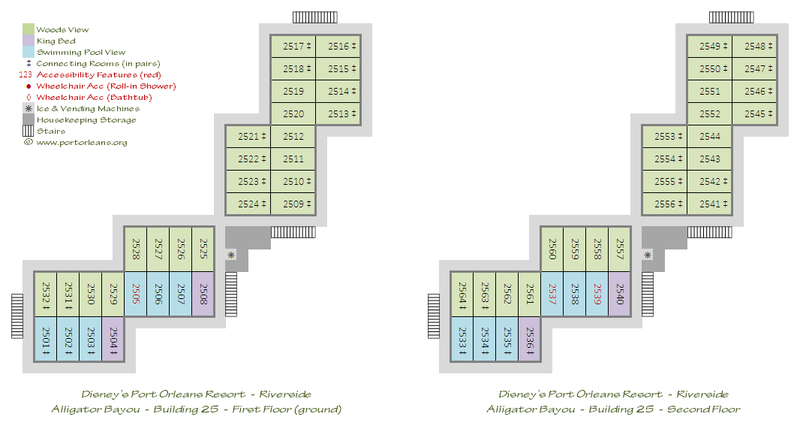 Note: there are no elevators in any of the Alligator Bayou lodges. From the start of 2011, Alligator Bayou lodges 14, 15, 18 and 27 were re-designated as ‘Preferred Locations’ and they are now charged at a premium price. You can guarantee yourself a room in one of those buildings by paying for that room category, but unfortunately this means that anyone with a standard booking now has much less chance of having a general request for these buildings honoured. The closest locations to request that are not now considered as ‘Preferred’ would be buildings 16 or 17. There is a clear advantage to staying in Lodge 14 in Alligator Bayou as this is right next door to the food court and just a short walk past the adjacent car park to the main South Depot bus stop. It’s an equally short walk to the closest leisure pool, or you can stroll over the main bridge to the swimming pool on Ol’ Man Island. 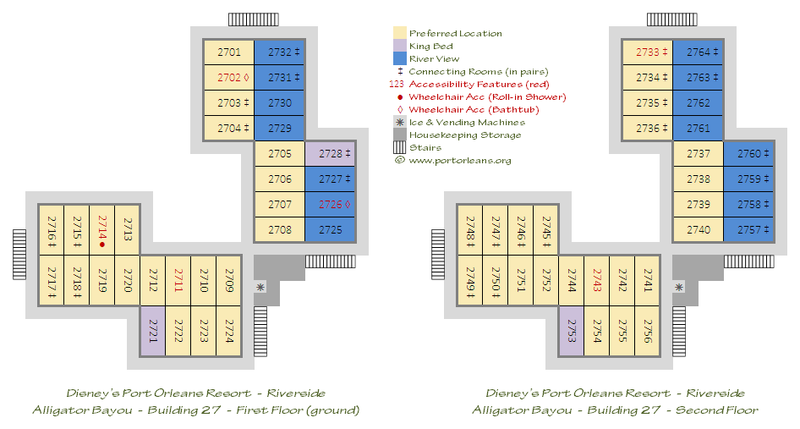 Some people have commented that there is a lot of foot-traffic past this location, but to be honest Port Orleans Riverside is so spread-out, with various meandering pathways to different locations, and the rooms are set back from the main walkways anyway, that it really isn’t a major issue. Lodges 15, 16, 17, 18 and 27 are the next best as they are all still relatively short walks from all the facilities. I guess in a perfect world, my own choice would be for the row of river-facing rooms closest to the food court (numbered from 1409 to 1416) or perhaps the row above those if you prefer the upper floor. A corner room such as 1412 would be about as good as it gets. 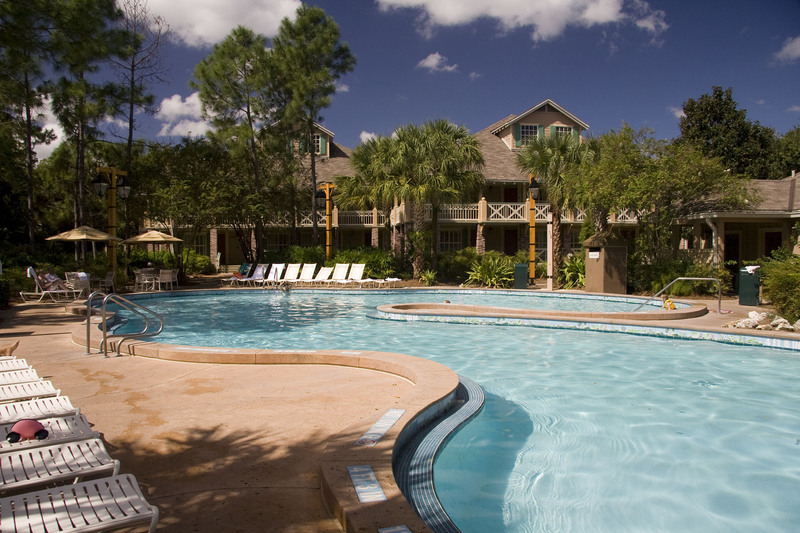 A little further away, in a slightly quieter area of Alligator Bayou, are Lodges 24, 25, 26 and 28, which have their own leisure pool and easy access to the West Depot bus stop. These are great if you’re not too worried about quick access to the main buildings or you’d prefer a more secluded location with a shorter walk to your car and the nearby bus stop. Finally, there is another cluster of buildings on the other side of Ol’ Man Island. Lodges 34-39 are some of the most remote and are situated between the West and North Bus Depots. A number of these rooms have parking lot views, but others do have pleasant views over another leisure pool. With the exception of lodge 38, which sits alongside the riverbank pathway and also provides easy access to Ol’ Man Island, it’s not particularly easy to recommend many of these buildings as they can be a good walk from everything — and when you’ve just returned from a long day at the theme parks, another ten-minute walk back to your room is probably the last thing you need. 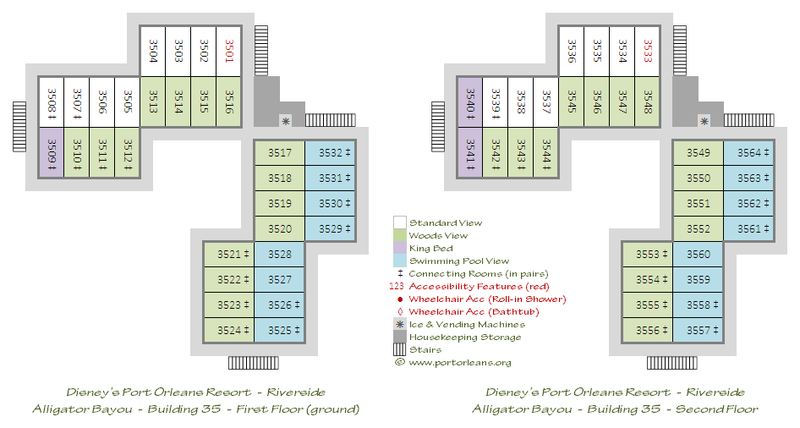 Where are the best room locations at Port Orleans French Quarter? Port Orleans French Quarter is the smallest of the Walt Disney World Moderate resorts and as such there really aren’t any bad Garden View room locations — even the Standard rooms which overlook the parking lot are mostly protected by lovely garden areas and trees rather than directly overlooking the cars. Notionally, the resort is split into the South Quarter (buildings 1-3) and the North Quarter (buildings 4-7) but there is really very little to differentiate these two charming New Orleans themed sections. Building 5 is generally considered to be the most convenient for the facilities — it’s the closest to the main building, the Doubloon Lagoon swimming pool and the ferry boat dock, but it still has fairly easy access for the one bus stop and the parking lot. River View rooms here and in building 6 are pretty much perfectly located. Building 2, to the south of the swimming pool, is also very conveniently located, and possibly a little less busy. River View rooms here are very close to the ferry dock and it’s fun to watch the boats arriving and departing, but some people have found the extra noise of the boat horns a little off-putting. The Pool View rooms located in buildings 2 and 5 overlook the busy swimming pool and can thus be a little noisier at times so you might prefer a Garden View room on the other side of those two buildings. However they are all very centrally located, and all but six are on the upper two floors. The best locations for quick access to the car parks without being too far from the centre would be buildings 3 and 4, with building 4 also offering the closest rooms to the single bus stop at the resort. 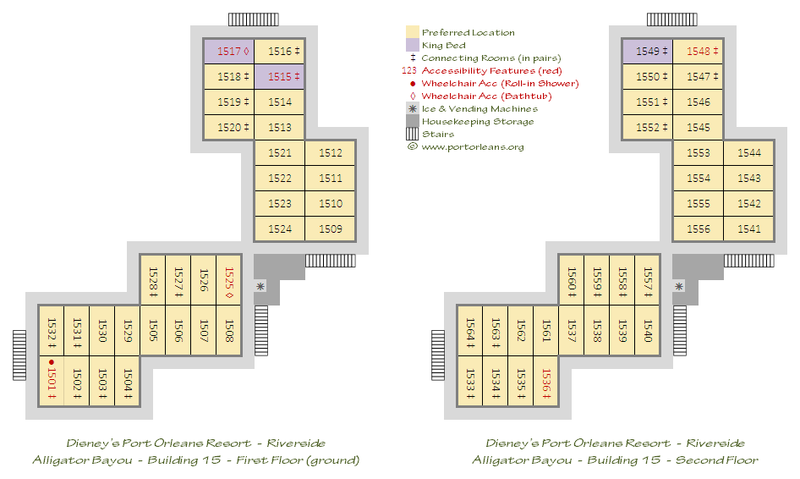 Building 4 is also closest to the food court, and is thus an excellent choice for anyone with mobility issues. The “Beignet Square” turfed courtyard which is surrounded by buildings 4, 5 and 6 is the venue for the early-evening outdoor movie screenings, which might be a factor worth considering if your room faces in that direction. For the quietest, most remote rooms, try buildings 1, 6 or 7 — with the river views from building 6 being especially pretty. 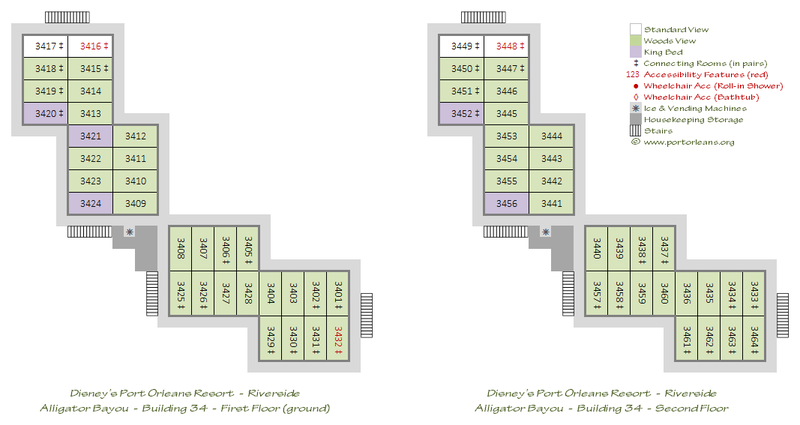 However as this is such a small resort even the furthest rooms in building 7 are still only a 350 yard walk from the main facilities so you can still get back to the food court within five minutes. So, now that you’ve chosen your desired category and booked your room, and you have a good idea of roughly where within the resort you’d like to be located, it’s time to check out our next page on How (and When) to Make Specific Room Requests. This includes suggestions as to the best ways to make your requests, the ideal timings, and general guidance on how the process usually works.